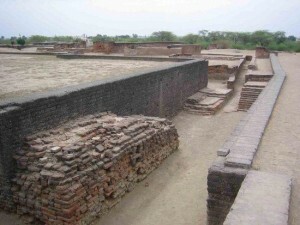 The ruins of a complete township of the Indus Valley Civilization have been excavated about 80 Kms from Ahmedabad and 6 km from Lothal-Bhurkhi Railway Station on the Ahmedabad Bhavnagar meter gauge section of the Western Railway. It is well connected by an all weather road with Bhurkhi. 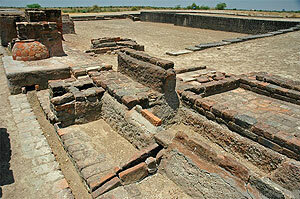 Ahmedabad, Dholka and other major towns such as Bhavnagar and Rajkot. Nearest airport is Ahmedabad. While planning the town, Lothal engineers accorded high priority to two other needs.The fulfillment of which depended the economic prosperity of the inhabitants. The first one was a dock for berthing ships and the second a warehouse for storing and examining cargo. The dock built on the eastern flank of the town is an engineering feat of the highest order. Its very location away from the main current avoided silting but at the same time ships could have access to the dock in high tide. The second need, namely the warehouse, arose from the large volume of cargo that Lothal had to handle. Hence, a warehouse was built close to the acropolis on a 3.5 m high podium of mud-bricks to serve as a clearinghouse for incoming and outgoing cargo. This entry was posted in Gujarat, Lothal and tagged indus civilization, indus valley, Indus valley civilization, indusvalley. Bookmark the permalink.